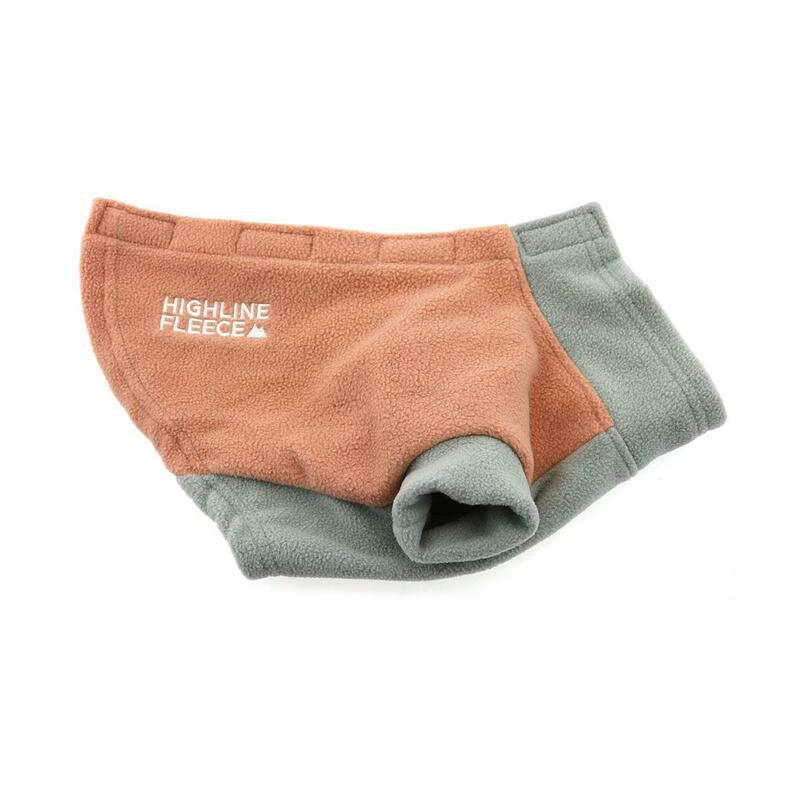 Keep your pup cozy with our new Highline Fleece Dog Coat in Coral and Gray by Doggie Design. The new step-in Highline Fleece dog coats are simply perfect and perfectly simple. Designed with ease in mind for both human and canine alike, after slipping the front paws through the coat, attach the touch fastener tabs at the top and you’re ready for the park. Made from a thick 280-gram fleece, these coats will keep every pup comfy and warm this fall and winter season. The touch fastener tab design across the back makes it easy to adjust fit and attach a leash to a harness or collar underneath. The Highline Fleece dog jackets are available in 6 color combinations to choose from and come in sizes that fit every breed from 3 to 150 pounds. For broad-chested breeds, look for the "LC" designation on the size chart. Highline Fleece Dog Coat by Doggie Design - Coral and Gray Customer Photos - Send us your photo! Polly is ready to explore and so comfortable in her Highline Fleece. Snug but in a good way! Posted On 12/12/17 by Cade O from Santa Rosa, CA Yes, Cade O recommends this product! I love this color! The fleece feels nice and thick and warm. I measured twice and I ordered what the tag says and they are perfect! Looking forward to more. Maybe they could use a full strip of Velcro instead of little pieces? Posted On 11/21/17 by Kathleen T from Taylorsville, KY Yes, Kathleen T recommends this product! Posted On 11/19/17 by Nicole from Philadelphia, PA Yes, Nicole recommends this product! Perfect fit! Made well. Love the color. Thank you Baxterboo! Posted On 11/16/17 by Don A from , FL Yes, Don A recommends this product! Live in NEFL and the weather can get chilly during the winter months. Our Greybies are thin skinned and can't be out for more than 15-20 mins without causing issues. Good coat for are needs, lite weight, and easy care. Posted On 11/11/17 by DeAnne K from , NE Yes, DeAnne K recommends this product! Posted On 11/03/17 by Jessie V from Savannah, GA Yes, Jessie V recommends this product! Love the quality and the price. I recommend air drying since it’s fleece so you won’t get static. Posted On 10/31/17 by Jean M E from Trenton, NC Yes, Jean M E recommends this product! This fits my tiny MinPin very well. I like this product because it is nice and warm and protects her belly from the cold and wet. I think she likes it too. Posted On 10/28/17 by Peggy C from , NY Yes, Peggy C recommends this product! I love this little jacket. It fits Ziggy perfectly, and is made with a good quality fleece, not some flimsy kind. My only critique would be that the Velcro closures were all one and were the length of the jacket. It tends to "buckle" where there is no Velcro. Posted On 10/26/17 by Rachelle R from Lake in the hills , IL Yes, Rachelle R recommends this product! Posted On 10/24/17 by Lynette T from New York, NY Yes, Lynette T recommends this product! My chihuahua is 5 pounds and it is very difficult to fit him. Baxter Boo is the only place I can shop for him. My problem is that he has a wide chest 14 inches and the rest of his body is small. In order to fit him, I need clothes that are between 14 and 15 inches in the chest. Baxter Boo is the only place where the measurements are displayed. I love this fleece dog coat on him. It blends in with his markings which are black and white. This coat will be perfect when the weather drops into the 40s. Posted On 10/24/17 by Julia W from Bayside, NY Yes, Julia W recommends this product! My dog looks so good in this new coat. In fact, my son, who never notices anything, commented on how nice this coat looked. I am quite satisfied. Posted On 10/24/17 by Peggy C from , Yes, Peggy C recommends this product! Posted On 10/23/17 by DIANNE M from , Yes, DIANNE M recommends this product! Enjoy looking through the website. Great prices.